West Flanders (Dutch: West-Vlaanderen [ˌʋɛst ˈflaːndərə(n)] ( listen); West Flemish: West Vloandern; French: (Province de) Flandre-Occidentale; German: Westflandern) is the westernmost province of the Flemish Region, in Belgium. It is the only coastal Belgian province, facing the North Sea to the north. It has land borders with the Netherlands to the northeast, the Flemish province of East Flanders to the east, the Walloon province of Hainaut in the southeast and France to the west. Its capital is Bruges (Brugge). Other important cities are Kortrijk in the south and Ostend on the coast, Roeselare and Ypres (Ieper). The province has an area of 3,125 km² which is divided into eight administrative districts (arrondissementen) containing 64 municipalities. The North Sea coast of Belgium, an important tourism destination, lies in West Flanders. A tram line runs the length of the coast, from De Panne on the French border to Knokke-Heist on the Dutch border. West Flanders consists of the North Sea coast, followed by a very flat polder landscape. Only in the south are some small hills, with the Kemmelberg (159 m) being the highest point in the province. The Leie and IJzer are the main rivers. 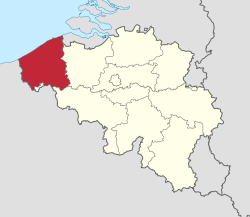 West Flanders is both the only Belgian province that borders both France and The Netherlands, and the only non-landlocked province. In the north of the province, most industry is concentrated in and around the cities of Bruges and Oostende. Both cities also have important seaports: the port of Bruges-Zeebrugge and the port of Ostend. The south is known for its textile industry, with companies such as Beaulieu and Libeco-Lagae. The region around Kortrijk is called the "Dallas of Belgium" for its entrepreneurship. Tourism is also an important industry in West Flanders. Major touristic attractions include the Belgian coast, the historic center of Bruges, the Yser Tower in Diksmuide and Flanders Fields, the World War I battlefields around Ypres. The region has a very distinct dialect of Dutch called West Flemish. This distinctive dialect is a part of the strong sense of identity of the inhabitants of the region. The city of Bruges has two clubs playing at the highest level of football in Belgium (Belgian First Division A), namely Club Brugge and Cercle Brugge. Other cities with teams playing at the highest level are Kortrijk (KV Kortrijk), Ostend (KV Oostende) and Waregem (Zulte Waregem). The teams Knack Randstad Roeselare and Prefaxis Menen play in the highest volleyball league. Knack Randstad Roeselare also plays in the CEV Champions League, the European Championsleague. BC Oostende is a basketball team which plays in the major basketball league of Belgium. The Province of West Flanders is divided into 8 administrative arrondissements. The Province of West Flanders is divided into 4 judicial arrondissements. Municipalities that have city status have (city) after their names. ^ Vlaanderen in isolation: [ˈvlaːndərə(n)]. Wikimedia Commons has media related to West Flanders. Wikivoyage has a travel guide for West Flanders.